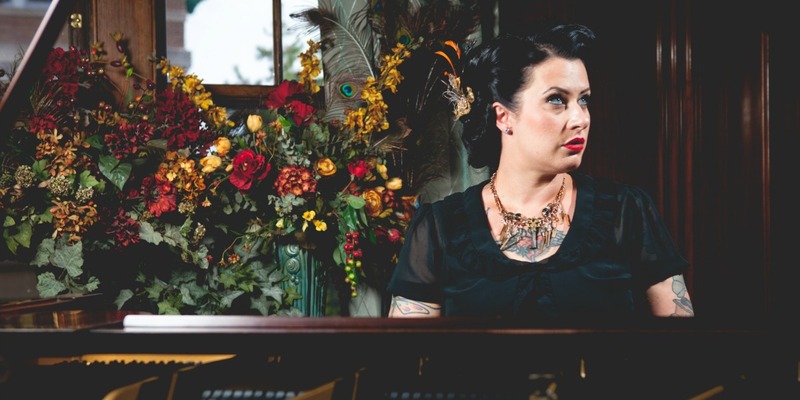 DAVINA & THE VAGABONDS have created a stir on the national music scene with their high-energy live shows, level A musicianship, sharp-dressed professionalism, and Sowers’ commanding stage presence. With influences ranging from Fats Domino and the Preservation Hall Jazz Band to Aretha Franklin and Tom Waits, the band is converting audiences one show at a time, from Vancouver to Miami and across Europe. In 2011 Davina released her first full length, all original album Black Cloud. It was named one of the 10 best releases of the year by the Minneapolis Star & Tribune and awarded 4 ½ stars from Downbeat Magazine. Their next release in 2014, Sunshine, hit number 13 in the Billboard Blues Chart and led them to be a musical feature on the hit BBC show, Later with Jools Holland. Bringing you 100 years of American music and Davina’s originals, which lend themselves to the American Songbook, the band brings edgy nostalgia to older generations and fresh new music to younger ears. This rollicking quintet is held together by Sowers’ keyboard playing, with acoustic bass, drums, and a spicy trumpet and trombone horn section. The group’s focused, clean sound and emphasis on acoustic instruments is novel to both blues and jazz worlds, and sets the show closer to New Orleans than to Chicago. This has set the Vagabonds apart at festivals in Thunder Bay, Ontario; Sighisoara, Romania; Sierre, Switzerland; Kemi, Finland; the 2012 New Orleans Jazz and Heritage Festival, and 2013 Monterey Jazz Festival ( in 2014 was asked back to play their main stage in 2014, Vache de Blues in France, and North Sea Jazz Festival. Catch this one-of-­a-­kind live show while they are in town! A $1 Facility Fee will be added to the price of each ticket.